Literacy Action of Central Arkansas » “Free to Read” – Literacy Action in the News! “Free to Read” – Literacy Action in the News! A wonderful story of continued success about our partner program with the women of Westover Hills Presbyterian at the Pulaski County Regional Detention Center! Here’s just a snippet of the article written by Rachel Herzog from the Arkansas Democrat-Gazette. 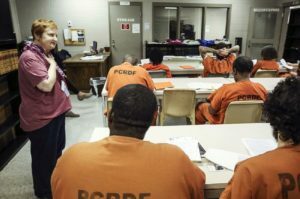 Four inmates attended the first literacy class at Pulaski County jail in January 2016, and volunteers Kathy Rateliff and Lucy Sausen weren’t sure how things would go. “They looked at each other, and they weren’t quite sure what these middle-class women were doing here,” Rateliff said. By the end of class, there was hope. Now, every Thursday morning, about 15 men meet in a multipurpose room on the jail’s lower floor for an hour to work through poems, short stories and vocabulary exercises. A similar-size class of female inmates meets Friday mornings. A total of 323 inmates have attended the class at least once. We are so fortunate to have community partners like Westover Hills Presbyterian who give their time and resources to invest in the futures of Arkansas inmates! To read the full article, visit ArkansasOnline.com.